Pro-Linea has all the elements to create a modern and refined work environment. The clean lines of this collection bring a fresh look without compromising functionality and durability. Drawers on ball-bearing slides for smooth and quiet operation. Also available in Cognac Cherry finish. Four casters provide easy mobility and two of them lock. The fabric resist to tear, light, abrasion and piling. Moreover, it is made of 100% recycled fibres. Put the extra in extraordinary with this 3 drawer filing cabinet on 5 castors ! 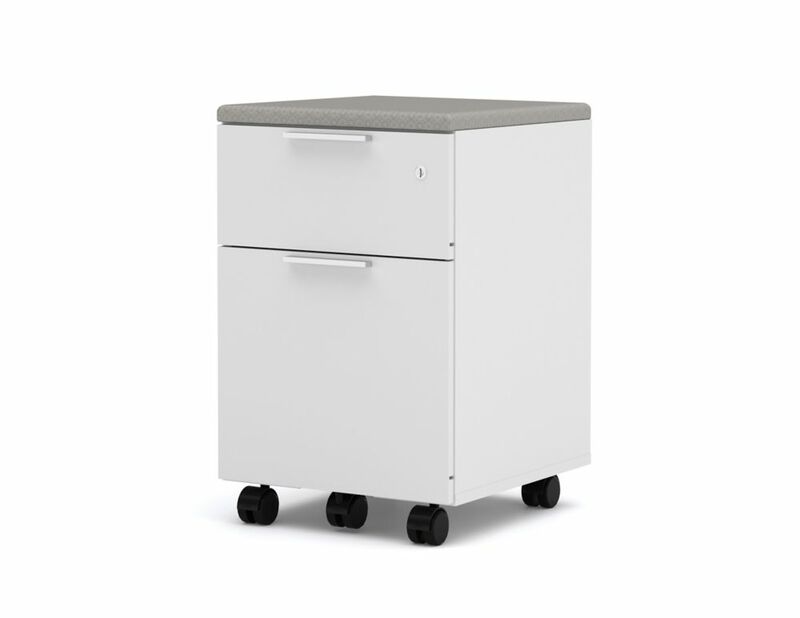 Add this multi-functional filing cabinet, finished in white with a grey cement-look top, to any desk or table to create more storage in your home office. Accented with simple modern silver colored handles, the top two drawers are useful for files, papers, books while the bottom drawer can fit standard or legal sized hanging folders. Whether tucked under a desk or placed on the side for a printer, books or other decorative items, this filing cabinet can be the little extra you needed in your office space. Practical and sleek, your Nexera manufactured wood filing cabinet will fit in anywhere. Safety and organization of your important documents are insured with this cabinet made out of manufactured wood. Organization or paper clutter in your home or office is easy with this filing cabinet. Pro-Linea Assembled Mobile Pedestal in White Pro-Linea has all the elements to create a modern and refined work environment. The clean lines of this collection bring a fresh look without compromising functionality and durability. Drawers on ball-bearing slides for smooth and quiet operation. Also available in Cognac Cherry finish.